Pallet deliveries are the best days. If you want a replacement diff for your 4k trans (or any other trans parts) I can send you the one I just pulled out for my torsen->locker science project. I'm planning to clean out the garage this weekend so LMK before I send it to the scrap bin. the german wrote: If you want a replacement diff for your 4k trans (or any other trans parts) I can send you the one I just pulled out for my torsen->locker science project. I'm planning to clean out the garage this weekend so LMK before I send it to the scrap bin. I'm never above spares! Let me know what you need from me. I did some calculations with the 5000q Avant gear ratios, it won't actually be bad at all, top speed @ 3700 RPMs in 5th is about 95 MPH, cruising at about 3000 (average 5th gear cruise for most TDIs) is 77-79 MPH. With a simple 5th gear swap to 0.60 from a Porsche 016, that would drop down significantly to 94.4 MPH at 3000 RPM, cruising at 63 at 2000 RPM. Pending good weather, guy is heading out next Monday to get the motors from Canada. 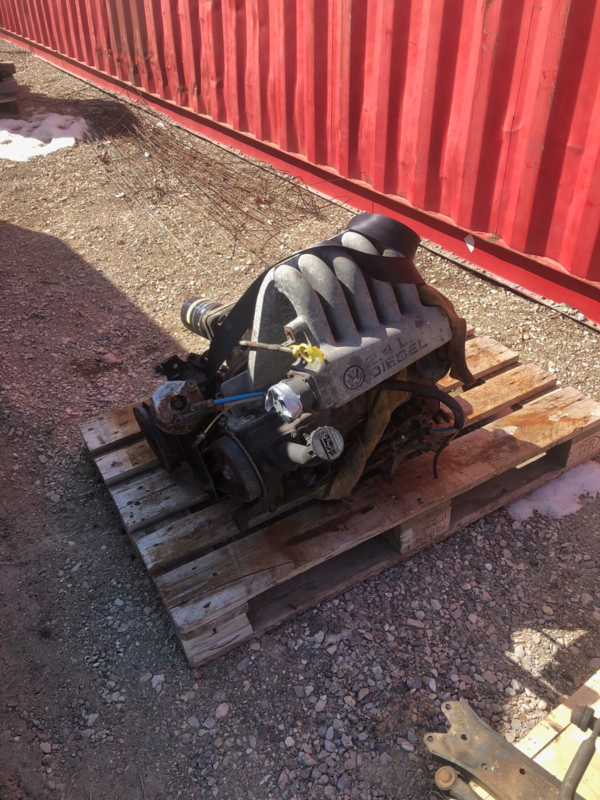 Engines should be arriving Saturday or Sunday! Also found out the Coupe GT transmission I have as a spare has a really tall 5th gear, which will be perfect for my 016 for the TD. That's a nice score, love it when the spares bin comes to the rescue! 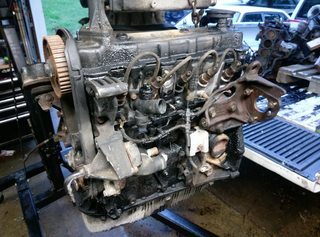 Engines are here, I have enough parts for 3, sans injection pumps and timing belts, but easily resolved. She left the shop under her own power. Man, you just keep quietly banging out milestones, congrats on the progress! - The MC1 was removed from the 5000q Avant, and the 2.4D is installed and running.